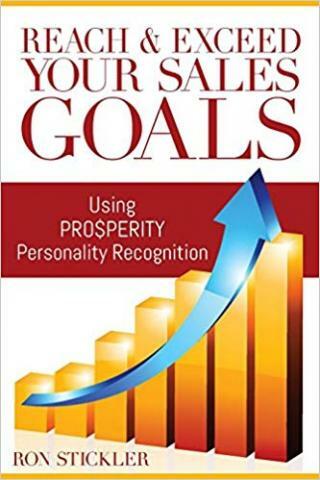 Award winning sales expert Ron Stickler announced Reach & Exceed Your Sales Goals: Using Prosperity Personality Recognition, a new book on how to improve sales success by identifying and leveraging personality types. Ron Stickler, an award winning sales strategist and author, launched Reach & Exceed Your Sales Goals: Using Prosperity Personality Recognition. The new guide is designed to help sales people improve their sales efficiency and sales managers optimize their staff motivation practices to achieve their sales and marketing goals. Based on personality recognition as the foundation of solid sales practices, the book is ideal for everyone looking for actionable strategies to develop sales success based on mutual trust and efficient communication. More information can be found at https://www.prosperitypersonalityrecognition.com. The four personality types used by Ron Stickler are the Driver, Analytical, Craftsman and Persuader, each with their own combination of traits such as friendliness, sociability, decision making abilities, and various others. By offering a practical way to identify the personality types of both themselves and their prospective clients, the book allows sales people and managers to develop efficient strategies to better communicate with individuals of each personality type. The book helps readers identify the essential reasons why individuals choose to purchase a specific product or service, and practical tips to address these motivations. Since the strategies provided in the book are not restricted to a specific industry, they are useful both for sales people and everyone looking to improve their persuasion and general communication skills. The book is based on Ron Stickler’s extensive experience as a multi-million dollar award-winning salesman. Ron is the recipient of prestigious sales awards such as Fairfield’s Outstanding Sales Leader and Hat Trick Recognition.